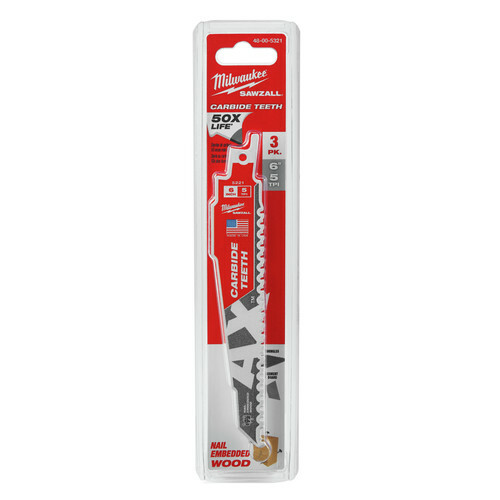 *Add two Milwaukee 48-00-5321 Saw Blades to your cart and the free item will automatically be added. Limit 2 free items per customer. Offer valid until 11:59pm ET on April 30, 2019 or while supplies last. No adjustments to previous purchases. Subject to change without notice. The Ax with Carbide Teeth, engineered to deliver long life in the toughest applications while being the fastest carbide-tipped reciprocating saw blades on the market. These new blades will deliver 30x longer life over standard bi-metal blades and 2x faster cutting than other carbide blades. The AX with Carbide Teeth features optimized carbide tipping technology that delivers extreme life. A fast, aggressive 5 TPI blade design allows for the fastest cutting in nail-embedded wood and a wide range of residential material. In addition, The AX with Carbide Teeth will feature Milwaukee patented features Nail Guard and Fang Tip. Nail Guard allows the user to Rip Nails Not Teeth, delivering extreme durability. The Fang Tip provides the fastest plunging on any wood cutting blade on the market. The AX with Carbide Teeth is optimized for Cordless Reciprocating Saws delivering over 25% more cuts per charge.